What might USA Basketball’s 2020 Olympic roster look like if every previous Olympian (Kevin Durant, LeBron James, Carmelo Anthony) flaked out and stayed home? The Rio Olympics are just now approaching the medal round, but it’s never too early to look ahead to the next Olympic cycle. Just ask two-time Olympic gold medalist LeBron James, who said this week that he is considering a return to USA Basketball for the 2020 Olympics in Tokyo. The Tokyo squad, which will be coached by San Antonio’s Gregg Popovich, could be absolutely loaded. In addition to James, who would be 35 and in elder statesman mode, let’s imagine a roster that includes 2016 Olympians Kevin Durant, Paul George, and Kyrie Irving plus 2012 Olympians (and Rio no-shows) James Harden, Russell Westbrook and Anthony Davis. All six of those guys would be 31 and under, giving Popovich an embarrassment of riches still in its collective prime. Unfortunately, watching an ideal “Dream Team” roster thin due to injuries and other obligations has become a well-established ritual. Indeed, the 2016 Olympic team has so far been defined more by who it doesn’t have—James, Stephen Curry, Westbrook, Harden—than who it does have in light of its forgettable play and close-victory margins in the opening round. So let’s conduct a (rather cynical) thought experiment: What might USA Basketball’s 2020 Olympic roster look like if every previous Olympian flaked out and stayed home? No James. No Chris Paul and Carmelo Anthony comebacks. No Rio re-runs. What if USA Basketball chairman Jerry Colangelo and Popovich had to start their 2020 Olympic roster from scratch? 1. Eligible Players: Current NBA players, including those with world championship and World Cup experience, are eligible. Former Olympians are not. Current college players will also be excluded in this exercise. 2. Age: The average age of USA’s 2016 roster is 26.8 years. The goal is to keep the All-Tokyo Team’s roster in the same ballpark. 3. USA Basketball ties: Players with FIBA World Cup or world championship experience were afforded extra credit given USA’s preference for picking players with ties to its program. Veteran players over 25 that have withdrawn for personal reasons multiple times over the years, like LaMarcus Aldridge, were not considered. Ditto for veteran players over 25 that have been unavailable on multiple occasions due to injuries, like Blake Griffin. 4. Positions: While no team is perfect (just look at the Rio roster), the All-Tokyo Team will endeavor to have a relatively balanced roster that can play big or small and that can keep multiple ball-handlers on the court at the same time. 5. Timberwolves center Karl-Anthony Towns, an obvious pick, was left off because he expressed a desire last year to continue representing the Dominican Republic. Let’s run this down in order of preference. The must-have headliner for this rookie Dream Team is no surprise. After getting cut from the 2012 London team, the back-to-back MVP withdrew from Olympic consideration during the 2016 playoffs, leaving a massive void. USA Basketball misses his deadeye shooting, his cheeky finishing, his familiarity running an offense, and the sheer excitement and pandemonium that he generates when he steps on the court. One might reasonably argue that this was the summer for Curry to make his maximum impact, given his age, his sky-high popularity and the Warriors’ ongoing success. Still, Curry will only be 32 in 2020, the same age as Anthony this summer. By that point, Curry’s trophy case could be stocked with a few more MVPs and championship rings. Although he won gold at the 2014 FIBA World Cup, an Olympic gold would be the only thing missing. Start recruiting him now, Pop! The 2016 MVP runner-up excused himself from the team in June due to the birth of his first child, noting in a statement that he hoped to compete for USA Basketball in the future. Leonard’s longstanding relationship with Popovich, his experience in a pass-and-move offense, his three-point range and catch-and-shoot skills, and his ball-hawking defensive ability combine to make him a natural pick. He would be the right age, too, as he would enter Tokyo in his prime at 29. USA Basketball has had to dig pretty deep to fill out its frontcourt in recent years. That will almost certainly be the case in 2020, unless Davis, DeMarcus Cousins and other previous Olympians decide to return. If Towns is indeed off the table, Drummond looks like the most proven option among Olympic rookies. Detroit’s new max-contract center fits the mold of the high-efficiency finishing, high-volume rebounding big man we’ve seen in Games past (Tyson Chandler in 2012, DeAndre Jordan in 2016). Although Drummond won gold at the 2014 FIBA World Cup after just two NBA seasons, the 2016 All-Star will only be 27 years old in 2020. Perfect. Wall has had a frustrating experience with USA Basketball, given his early cut from the 2014 World Cup team and the fact that he’s been stuck for years behind the likes of Paul, Westbrook, Curry and others. In Rio, though, USAB could have really used Wall’s blow-by dribble penetration, his drive-and-dish instincts, his size and length on defense, his ability to create transition opportunities, and his ability to defend multiple positions. Come 2020, there’s a decent chance USA will again find itself needing some new blood at the one position. Colangelo plugged a hole this summer by tapping Raptors guard Kyle Lowry for his first Olympic duty at age 30. Mending fences with Wall, who will be 29 in 2020, would fit a similar timeline. Just about everything written above about Wall’s experience with USAB applies to Lillard, too. After missing out in 2014, Portland’s two-time All-Star was out of consideration for Rio, and then back in, and then out again, citing a foot ailment when all was said and done. While Lillard’s volume three-point shooting is his biggest strength, his familiarity playing on and off the ball would be a nice asset if he shared a roster with both Curry and Wall. Lillard’s off-criticized defense and his redundancy with Curry might lead to some fit questions, but he’s one of the few proven All-Star talents without Olympic experience who will still be under 30 in 2020. If Wall and/or Lillard decide to pass, youngsters like Kris Dunn and D’Angelo Russell would also be in the mix. Now, it’s time to start making some leaps of faith. Already? Yes, already. Consider: Of the 24 American All-Stars in 2016, 17 have Olympic experience and four more were listed above in this exercise. That leaves only Aldridge (his Olympic window has seemingly shut), Paul Millsap (he will be 35 in 2020), and Isaiah Thomas (a talented player who would definitely put on a show, but one who lands a little further down the point guard pecking order). In other words, it’s time to shift gears from proven stars to potential ones. Durant summed up Ingram’s future better than just about anyone else when he told reporters in Las Vegas that he viewed the 2016 No. 2 overall pick as being “a little [further] along” and “a little more fluid” than Durant was at the same age. 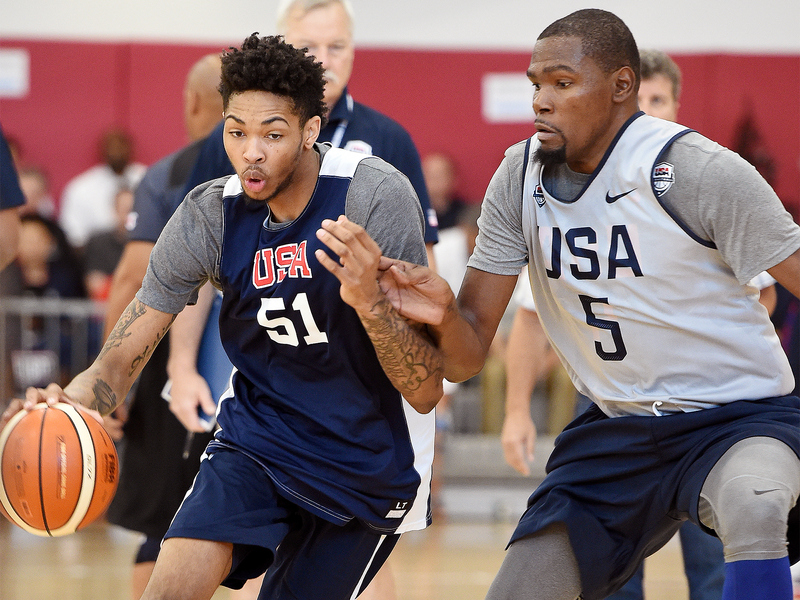 While Ingram, 18, will only be 22 in 2020, it’s worth remembering that Durant was just 23 when he won gold in London. The “Next Durant” comparisons might very well turn out to be both a blessing and a curse as Ingram continues to develop, but even if Ingram falls short of MVP-level play he would make a lot of sense for USAB. He’s long and athletic. He’s comfortable with the ball in his hands, he’s accustomed to facing up, and he should be capable of shooting the international three. And, perhaps most importantly, he’s capable of playing multiple positions depending on the size of the lineup around him. Given his variety of skills, it wouldn’t be all that shocking if Ingram made the cut for USA’s 2019 World Cup roster. This hypothetical roster is halfway home, but it needs some positional balancing. Enter Booker, a smooth-shooting teenager who projects nicely as a floor-spacer/playmaker at the two spot for Team USA. The Curry/Booker/Leonard trio has “ruthlessly efficient” potential. 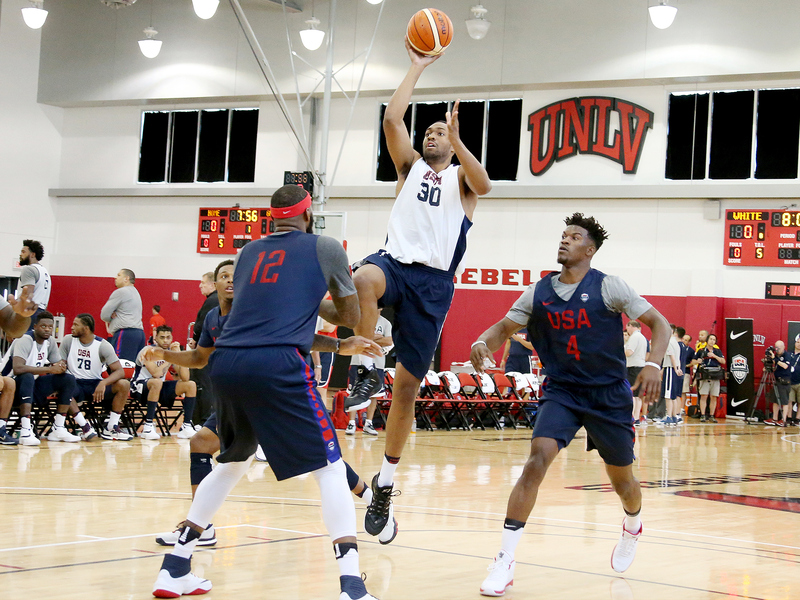 Like Ingram, Booker was in Las Vegas for USA Basketball this summer after performing like the best player on the court during his Summer League cameo. If he continues his ahead-of-the-curve developmental arc, the 2015 lottery pick has a chance to be a USAB mainstay. So many of the most promising young big men are international prospects: Towns (although he could theoretically still play for Team USA), Kristaps Porzingis, Jonas Valanciunas, Rudy Gobert, Steven Adams, Nikola Jokic and Jusuf Nurkic, among others. Unlike Krzyzewski in 2014, however, SI.com isn’t willing to settle for one of the dozens of Plumlee brothers in a desperate bid to fill out the frontcourt. Instead, Turner wins out as a developing big with the right combination of mobility, length, skills and upside. The 2015 lottery pick played his way into a postseason starting job as a rookie in Indiana, and his physique would contrast nicely with Drummond’s bulkier frame. Age-wise, Turner would be 24 in 2020, which is admittedly young by Olympic standards. He probably gets squeezed off by returning players in reality, but he’s a no-brainer selection in this exercise, and he should merit consideration for the 2019 World Cup squad if he builds on his rookie campaign as expected. Thanks to a knee injury that brought an early end to his rookie season, Parker hasn’t yet delivered on the Carmelo Anthony comparisons he generated as a prep star and at Duke. Still, much like Anthony, the 2014 No. 2 pick fits the mold as a smaller four in the international game, given his ability to create offense inside and out, hit the glass and exploit mismatches with both his quickness and strength. If the “You’re not quite right until the second year back from an ACL” theory proves correct, Parker could be in line for a “Remember me?! ?” campaign in 2016-17. When Tokyo rolls around, Parker will be 25 and likely in the All-Star conversation annually. Beal is always one year away from being the best young shooting guard in basketball … and one injury away from riding shotgun next to Eric Gordon on a long, dark highway to nowhere. Clearly, projecting his future four years out is a painful and touchy exercise. Beal Optimists will note that he is still just 23, with multiple strong postseasons on his record. Beal Pessimists might argue that Blazers guard CJ McCollum brings similar shooting and a little more off-the-dribble creativity in a similarly sized package. For now, Beal squeaks on to this list given his higher ceiling (McCollum is nearly 25), his shooting ability, his defensive potential and his ability to function more naturally off the ball on offense. USA Basketball loves itself some defensive-minded, do-everything wings, a line that can be traced from Tayshaun Prince (2008) to Andre Iguodala (2012) to Jimmy Butler (2016). The 20-year-old Winslow is a strong, smart and disciplined perimeter defender, one who should be able to credibly guard four positions in the international game given his quickness, instincts and rebounding ability. As a rookie in Miami, Winslow wasn’t asked to do much offensively, but he should get the chance to blossom on that end during the post-Dwyane Wade era. Winslow will be 24 in 2020; if that’s too young, or if his progress plateaus due to his limited range, Popovich might consider Gordon Hayward or Rodney Hood. Both players are mature all-around wings who play for former Spurs assistant coach Quin Snyder in Utah. Speaking of the Jazz, the final spot on this roster goes to Favors, another underrated and overlooked talent who hasn’t been able to gain much traction in USA Basketball’s program to date. For this team, Favors would provide frontcourt depth, serving primarily as a defensive anchor and glass-cleaning rebounder in bigger lineups for matchup purposes. Popovich better hope that Davis, Cousins, Draymond Green and other former Olympians opt in for Tokyo, otherwise he could be forced to play smaller than he might prefer. The next best options—Nerlens Noel and Hassan Whiteside—are harder to envision in red, white and blue. Here’s what the final All-Tokyo Team looks like if we stick to the criteria that only players without Olympic experience are eligible. This isn’t a perfect roster, but it’s a really solid one with a number of strengths: shooting, playmaking, defensive length and lineup versatility. The biggest weakness comes at the four spot, but the ability of both Ingram and Leonard to shift up should help cover up that hole. If this roster “feels young,” remember that four years is a long time. As mentioned above, the average age of the 2016 Rio roster is 26.8 years. Come 2020, the average age of the 12 players listed above is exactly the same: 26.8 years. The real takeaway from this exercise, though, is how valuable it is for USA Basketball to be able to lean on its returning players. As shaky as the Rio roster has looked at times, imagine where it would be without Durant and Anthony, its two previous Olympic participants. Now, let’s imagine that James is serious about an Olympic farewell tour in Tokyo and that 2016 standouts like Durant, George and Irving decide to run it back. All of a sudden, the Tokyo team looks much more like an A-list Dream Team, and that’s before Cousins, Harden, Westbrook and a host of other quality candidates even enter the conversation. After all of that, we arrive right back where we started: hoping that James isn’t just teasing us with the Tokyo talk, hoping that Curry gets the Olympics itch, and hoping that the rest of the NBA’s best fall in line behind them.